Now Samson is a bit of a controversial figure in the Bible. He does not really fit the image of the Holy Man of God. He is a womanizer, a trouble maker, an agitator, a long haired tough guy who is always finding new ways to get into trouble. Some might say he is a disaster in motion. He is clearly the Wild Man of the Bible. Any yet he is in the Bible. The status of Samson, Shimshon, among Jews, evolved over the years. One might say his fortune fluctuated with the times. At times he was viewed as a bad role model and at times as a hero. In modern times in Israel his star has clearly been rising. There are body building gyms called Shimshon, boxing clubs called Shimshon and even a combat unit in the IDF with the name Shimshon. Growing up listening to the classic Israeli comedy trio "Ha Gashash Hakhiver", I recall the following lines. The boys' teacher comes to see Salim, the Middle Eastern Jewish father of a promising bright young boy. "Mr. Salim, your son is very gifted and I can arrange a scholarship for him to study at the Weizmann Institute" (a real place and one of the top scientific research centers in the world). "What!" Responds Salim, as he spits on the floor. "Your son can go to Weizmann but my son will go to Shimshon Institute"
Samson, Shimshon, is clearly popular with the modern, secular Israeli mindset, but they are missing a key point. Samson was a judge of Israel! He was not just some bar going trouble maker, he was a man of God and he lived his life to serve Israel. Different times require different kinds of leaders. Samson was the man for his times. The people of Israel were being badly oppressed by the Philistines, (no relation, by the way, to the modern day so called "Palestinians" – a made up people). Samson attempted no such thing. Samson's guerrilla warfare shook up the Philistines, it reminded them that some Jews were still fighting, that some Jews would not accept this horrible situation, and that life would not be easy for the oppressors. Much like the Jews on Masada and the Jews in the Warsaw Ghetto Revolt Samson would keep the flame of Freedom and Revolution alive. Samson also was careful. During the Nazi era, any Jewish resistance was met with collective punishment. By acting alone Samson took all the "blame" for himself. He had no militia, he was a one man army and he knew that the retaliation would come on his head alone. He did not wish to endanger anyone else. And his legacy has been with us for thousands of years, and today, in the Land of Israel, there is a combat unit "Shimshon", in his honor. May we merit the Biblical words...And the land rested for forty years. Get the full story! Read all about all the Biblical warriors, their strategies, their weapons, their goals. 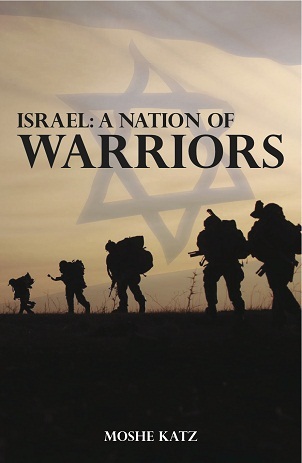 The history of the Fighting Nation of Israel from Biblical times until today. Over 300 pages. Come to Israel, the land of the Bible and the Prophets. Immerse yourself in the culture while training daily in Krav Maga and visiting sites of historic importance. The original Tour and Train. Only $1,400 for two weeks, action packed.